Today TRINAMIC is pleased to provide an update on the progress of this green energy initiative. The electro-mechanical design for the heliostat mirror movement control has been completed. This design includes a TRINAMIC motion controller, stepper pre-driver and motor coil MOSFETs for both axes: azimuth and elevation. The design also incorporates a separate TRINAMIC motion controller IC and stepper motor for the mirror locking mechanism, which prevents dangerous mirror movement in windy conditions. 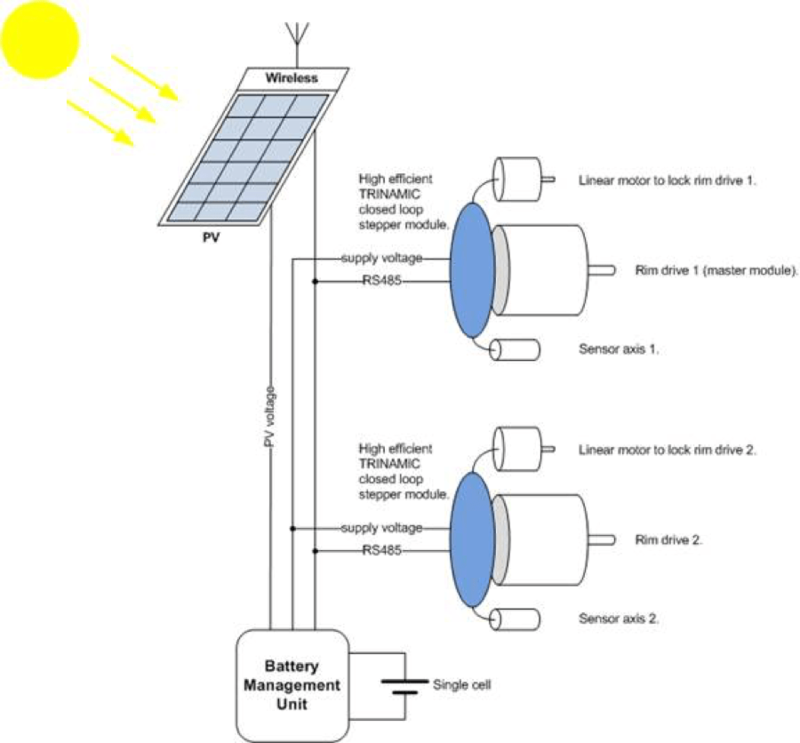 TRINAMIC also implemented the sun tracking algorithms employed by each autonomous heliostat mirror, as well as the battery management firmware, which uses a small photovoltaic to power the motors that drive the heliostat mirrors that, in turn, produce energy through the primary turbine. Field tests thus summer have confirmed operation of the mirror drives and locks, communication between mirrors and the central control unit, operation of the autonomous battery power sources, and accurate on-target tracking of solar movement. Economically successful heliostat implementations will require thousands to hundreds of thousands of individual mirrors, so efforts to reduce cost and increase efficiency for each heliostat will scale significantly to influence the total cost of a heliostat implementation.